Since assessing how embarrassing my room decor is, I'm home again to the embarrassment after a Hens on Ice rehearsal period. It's always nice to get out of a hotel room and enjoy the comforts of the coop. That is, when those comforts work. As much as I hate leaking hotel room toilets, busted faucets, and sensitive smoke alarms that detect my indoor smoking habit, at least the front desk or fire department will send someone to fix the problem. At home, my parents either cope or don't notice the problems, and they don't like when I call them at work with complaints. These household problems may be trivial and the epitome of "first world problems," but they still piss me off and long for a hotel repairman. 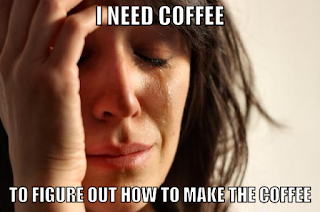 The coffee pot only works after a struggle of jiggling things, trying different outlets, and sometimes using a hairdryer. This is the last way I want to start my day: with a challenge before coffee. No. We have a weird "percolator" style coffee pot in the house. Mom longed for the "good old coffee a percolator makes," so Mr. Coffee got the boot and this thing came in. It seemed to get a little fickle last year, but it turned out to be a simple problem with an outlet. This time at home, that simple fix is not a solution. I plug in the pot and nothing happens. I move it around to different outlets in hopes that one will work. Then I juggle the cord where it's attached to the pot, where it sometimes needs to pressed or angled a certain way to start brewing. When that doesn't work, I need to bring out the hairdryer because the socket in the pot may have gotten damp from refilling the water. I blow dry the socket, juggle the cord a few times, try a few different outlets, and viola! Coffee starts brewing. Don't do this to me before noon. 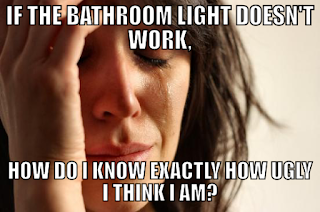 My bathroom light only turns on sometimes, if I hit the switch hard enough or hold the switch in a certain way for a minute. 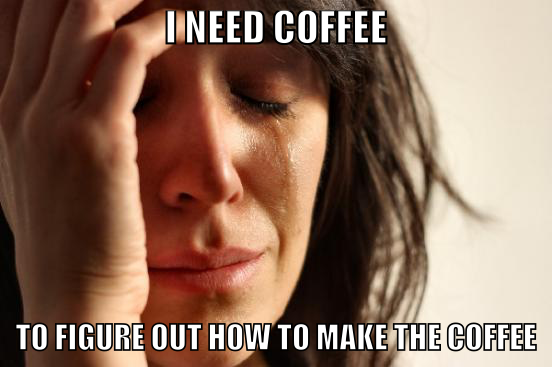 Again, this is not how I want to start my day, and I go to the bathroom before I even look at the coffee pot. A normal flip of the switch no longer turns on the light. I have to turn it on and off in a variety of ways, flipping it slowly, hitting it hard, or just punching the wall. When none of these techniques work, if I keep pressure on just the right part of the switch, the light stays on. Sometimes the light stays on if I let go very slowly and speak to it nicely. When that doesn't work, I have to shower, pee, and brush my beak with just a faint glimmer of natural light. 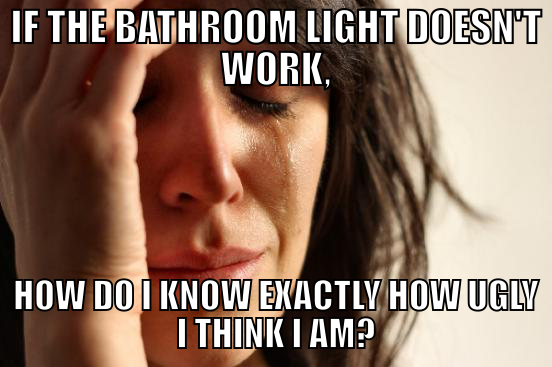 But anytime I think about bringing a lamp into the bathroom, the light somehow works. The living room TV screen went from working sometimes to not working. This obnoxiously-sized TV is the newest and largest in our coop. Yet, the picture started to only turn on sometimes, audio still playing, taunting us. 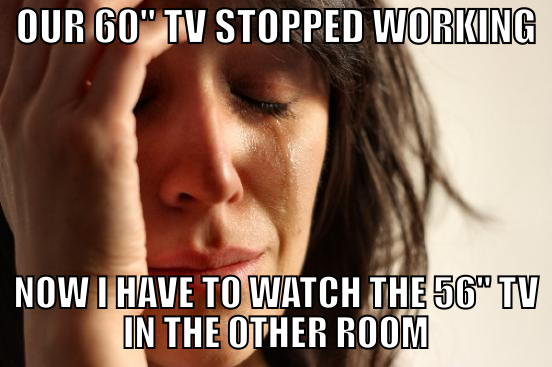 Again, there were theories to get the TV to work. Tap the power button really quickly. 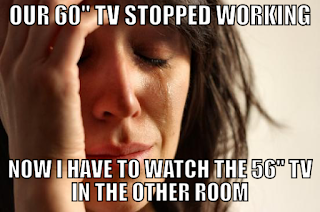 Unplug the TV for a minute and try again. Use the TV as an oversized radio. But this week, the TV just turned into a big radio, no more picture. I would walk into the room and hear the noise of the news or "Dance Moms," but there was no picture nor anyone nearby listening to it. After one too many times of this being the end result of father hen trying to get the picture to work and leaving the noisy room in a huff, I insisted we take the TV to a repair shop, or at least paint the screen to look like an old-fashioned Samsung radio. The CD player on the patio works sometimes, or stops mid-CD. Sometimes when I go for a bird bath or work on my tan, I like to add the old-timey feel of playing a compact disk. I'm a big advocate for the CD. While I'm all about digital music, there's still a place for a good album. And I'm not busting out the record player (which is apparently trendy now!) or the cassette, it's a CD. But our cheap CD player is showing its faults after living outside for 5 years. The CD usually starts fine, but then conks out in the middle of track 3 or 4. I open and close the disk lid to try again, and it will stop around the same place. I check the CD for scratches (none), blow on the CD, blow inside the CD player, punch the CD player, and it eventually goes to "no disk." But there is clearly a disk! Eventually I have to give up and plug my iPhone into the speakers. So much for my 2005-esque swim. The house is truly falling apart and I'm exhausted. It makes me long for a simpler time of Mr. Coffee, lit bathrooms, TVs that turned on, and CD players without the fickle attitude. I need to move or check into a hotel. Keep reading! Madonna, that's enough.